When it comes to effecting your signal, you’re hoping to create a sound that takes you places outside of the general dry signal of your instrument. By using effects, you emphasize parts, create and build ambiance, etc. To stand out of the mix, to provide intensity. We all know *why* we use effects. When I plugged into the Source Audio Soundblox 2 Stingray, I was expecting filter/modulation. We’ve heard it plenty of times. Autowah, phaser, enveloping wobbling effect, etc. Well.. I was utterly blown away by this pedal. There are some pedals I’ve played that do what I expect it, but there are others that actually open you up to creativity. This is one of those part/song writing pedals. There are so many options with this pedal that I would lead to song parts for me. Fantastic creative tool! What initially caught my attention, were the extremes the Stingray could achieve. Sometimes extreme means un-usable, but they were able to push things so far, yet completely awesome and usable! The next item that I noticed is the site. The amount of processing power this pedal can pull off, with this small of a footprint, is incredible and within a very sturdy enclosure. This pedal is both complicated and extremely easy to use. At first, the options are many, but after a few passes, it’s really super easy and efficient. The first item of business.. this pedal has 2 presets.. which is great! You can define individual presets and saving is a snap! You can configure the pedal to go into tap tempo mode as well, where one of the buttons is tempo control. The Stingray has 12 filter effects that span across different areas of enveloping – Single peak, Low pass, Phasers, High pass and Multi peak. There is an ‘option’ knob that is assigned to a particular option mode – Frequency, resonance, mix, volume, drive and tone. Set the mode.. adjust the level with the option knob. There are also Depth and Speed knobs. The Mod Source is basically the wave pattern – Sine, Square, etc. With the Stingray, you can go extremely subtle to crazy over the top. The ability to add drive is fantastic too. To me, this is the ultimate filter pedal.. hands down. I get asked about the bypass of these pedals too. The Soundblox, is quite innovative by allowing you to go from True Bypass to Universal Bypass if desired. The Universal Bypass is their version of a buffered bypass, if you’re wanting true bypass you can set that as well. Overall, this pedal is crazy good. If you’re interested in a filter pedal.. look no further. Source Audio.. has done it again! 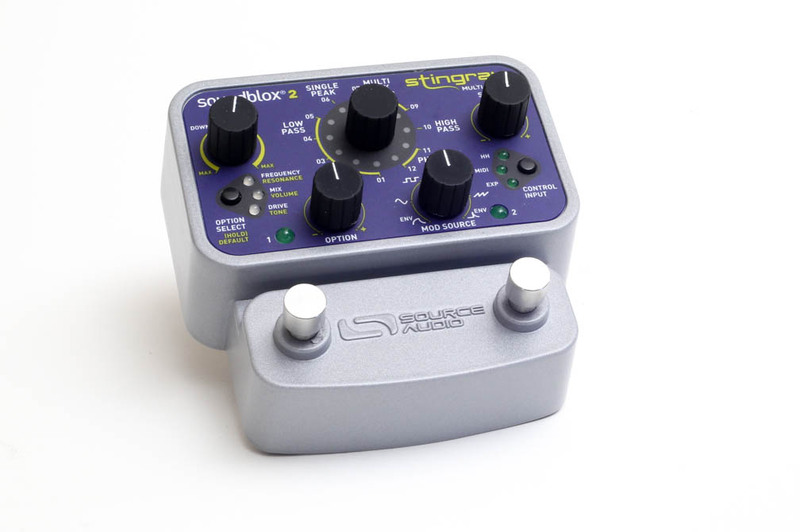 Also, I want to mention that the Source Audio Soundblox 2 Stingray give away is still happening. Do not miss out on this people! To enter go here: Source Audio Soundblox 2 Stingray Give Away! Excellent Deal on the MXR Phase 90 at Amazon!